Someone has taken the trend of reboots one step too far. 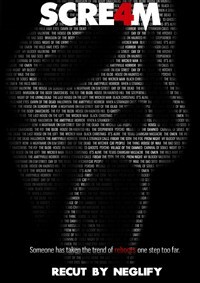 Scream 4 had the potential to really reboot the franchise and create a new trilogy with a new lead, but they muffed it all up. My main purpose was to completely change the tone of the film by fixing the ending. Instead of having everything wrapped up neatly, it ends with a cliffhanger. Sadly, this sets it up for a whole new trilogy that will never happen the way I want it. This is the second in my “Quick Fix” series. QuickFixes are simple fanedits of films I enjoy. The primary intention is to trim the movie here and there to improve pacing, tone or characters. These aren’t edits that substantially fix a bad movie. If you don’t like the source movie you won’t care for this fanedit. Thanks to TMBTM for reviewing my workprint and giving great feedback. Drinking Game subtitle track and an easter egg. The biggest change is the ending. When I first saw Scream 4 I was so upset with how it ended. It went on too long and resolved itself too easily. I thought to myself “If they had cut to black at [blank moment] it would have been perfect.” So I wanted to see how it would play out with a new ending. And along the way I made a few minor nips & tucks to the film here and there without going too overboard. Added “Fanedit.org” video logo at the beginning. For the Stab 7 opening scene I switched to R1 audio. Added “Recut” to the opening title. For the scene with Kirby, Jill & Olivia in the car I used the R1 audio. Added deleted scene “Crime Scene” after Gail’s scene at her computer. The deleted scene was trimmed to cut out showing Jenny Randall’s body and to cut out Dewey and Deputy Judy’s conversation. Added deleted scene “Discussing the Murders” after Gail’s scene with Rebecca. Cut out Deputy Judy’s creepy red-herring conversation with Sidney outside Jill’s room. Added deleted scene “Trevor Visits Jill In The Hospital” after Gail’s scene with Robbie and Charlie outside the hospital. Added music from Scream 1. Also trimmed Trevor’s dumb lines at the end. Cut Rebecca’s death scene in half. (See what I did there?) After Ghostface jumps on her car and she screams it cuts to Dewey’s press conference. This was to match the way it was written originally. Added deleted scene “Kirby and the Boys” after the Cinema Club scene. Cut Perkins’ over-the-top death scene. This was to match the way it was written originally. After Dewey tells Jill that Sidney’s in ICU and Jill says “What?” the screen smashcuts to black. This was done to match (as best as possible) the original ending. Added “Recut by Neglify” before the end credits. Replaced all end credits music to include the greatest song ever in a Scream movie, RED RIGHT HAND. The fact that this song wasn’t in Scream 4 was a huge beef for me. Well this was a new way to experience a fanedit. Instead of watching it right after getting the Blu Ray of Scream 4 I had this on my hard drive for quite some time because I never felt in the mood. 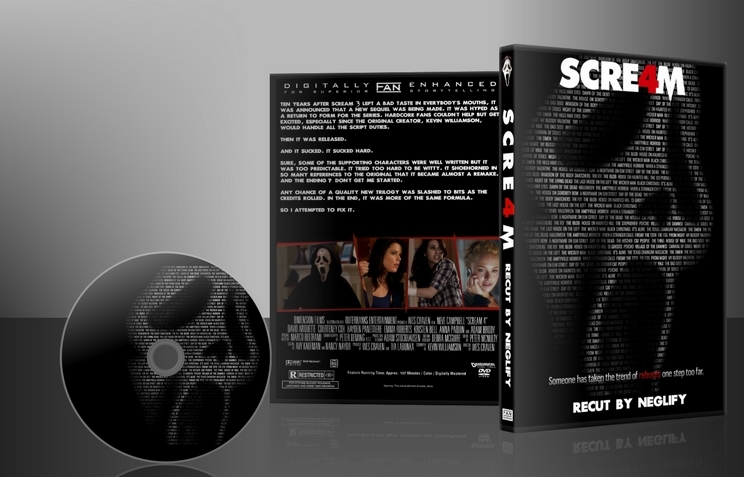 Today I talked about how much I liked Scream 4 and instead of rewatching the original I put in this disc to see if it would be a possible improvement/replacement if I ever again get in the mood of Scream 4. Does it replace my Disc? No, but it was close. Most of the cuts are super well executed and you don't notice them. The only two instances I noticed the editor's work was after the scene where the kids talk at the fountain and the cut from the police murder to Sidney. Neg got rid of a lot of things that troubled me - especially the killing of the reporter is something I am so glad the way it plays out in this edit! This was really the most generic horror moment in the entire film and I am glad that it is gone. Same goes for the Bruce Willis line - it is funny but the movie at this point is in serious mode so it should not be there and is not missed. The added deleted scenes put a good focus on the new kids although I kind of see why the fountain discussion was cut as the killer is using the same line abotu there being a movie in both scenes so it was a bit of a giveaway. Also removal of the red hering police character is good, it was just too suspicious a set up to make for a believable killer. in a movie like scream we don't look for obvious motifs but for the most innocent person to be the killer. Now the reason this doesn't replace my dvd is the ending. I really like the original ending especially the line about remakes and originals but that is not the issue i have with the ending here. I was talking to a friend about how i love that scream 4 is a standalone movie with no promises for future installments/tie ins. From time to time I just want to watch a movie and be done with it and not having to wait for the sequel to fill in the blanks. This is a nice fanedit. The movie is not radicaly changed, but what is cut is not missed and what is added works well. I like the original ending but I can totaly see this new one working in a “fanedit alternate universe” where a direct sequel would have been shot back to back and would be “soon to be released”. All in all a good work but being one who liked the original I maybe wanted even more changes to really justify the “need” for a fanedit. Those who did not like the original ending and some other things should enjoy this edit.